First cat# on back cover. 2nd on labels. Sub-title: "Recorded at a concert at performance in the Grand Hall of the Moscow Conservatory"
Spine string: "Frank Violin Sonata in A, etc. 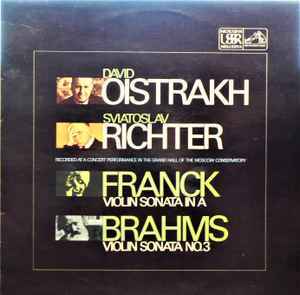 D. Oistrakh/Richter"
"Recorded in the Grand Hall of the Moscow Conservatoire, 28h December 1968." Uncredited liner notes in English (only): © Capitol Records, Inc. 1969. "Recorded by Melodiya in the U.S.S.R." and "Manufactured in the U.K. by EMI Records Ltd." with Melodiya and HMV logos. "Made and Printed in Great Britain"
"Printed and made by Garrod & Lofthouse Ltd."
Use of "Super Emitex" recommendation. Red labels / Black text. Includes a generic EMI printed protective plastic inner sleeve, made in Great Britain, with a copyright "Important Notice" and a "Care Of Your Record" recommendation.